Both this and Eggs Florentine are popular throughout the day, not just for breakfast or brunch. 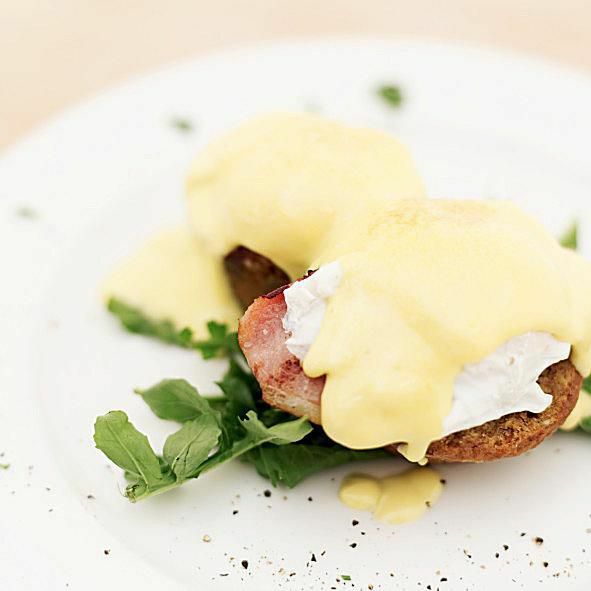 No doubt this is because of the perfect combination of ingredients - poached egg and spinach or ham on an English muffin topped with a silky, buttery hollandaise. Preheat the grill. To poach the eggs, bring a pan of water to the boil and add the vinegar. When simmering, gently crack the eggs and slip them into the water without breaking the yolks. Poach the eggs for about 3 minutes or until the whites are set but the yolks are still soft. Meanwhile split the muffins and toast them on both sides on the grill. Put a slice of ham on each muffin half and warm under the grill. When the eggs are done, lift them out on a slotted spoon and pat dry with kitchen paper. Place one on each muffin half and spoon over the hollandaise.